I always like to watch Eurovision but this year I was watching it on my own so decided to do my nails while watching. 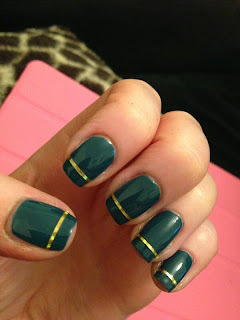 I decided to use the tape I bought on ebay recently with the blue/green polish I also bought on ebay. I thought I would keep it simple and make almost a French manicure with the tape. I actually really like the results and placing the tape was easier than I expected. I put one coat of CND's Stickey as a base, then two coats of Orly's Sapphire Silk. I waited for this to dry, then applied the tape, trimming afterwards, then applied a coat of Seche Vite to really set the tape. Hope you like this mani! Ooh I like them - very classy! Thank you! The tape does add a touch of class! Lovely job look very pro!! They are gorgeous, really love the colour and it looks lovely with the gold :) thanks for following! Thank you! I don't go for too many greens so I was delighted with this one.